. : Home :: Artists :: Albums :: Family Tree :: Palladium Fanzine :: Contact :. The mainman behind Radium Wreckords is Jonathan 'Rat' Handley, a man with an unusual (some people might say "warped") view on life and music. Handley is a prolific songwriter and plays guitar, bass, drums and sings. He was born in Tanganyika (now Tanzania) on 5 June 1954. His family moved to Springs when he was almost three. Handley explained: "Being a geologist, my father oscillated between Welkom and Springs from the Fifties to the Seventies". Handley learnt to play guitar in Springs and Welkom. After leaving Welkom High School, he studied Medicine at Wits University. His first band in 1977 was known as the Warehouse Rats (because they rehearsed in an old warehouse). This band evolved into Slither with the addition of fellow medical student John Griffith. Griffith went on to record under the name John Ireland. Slither drummer Niall Bell introduced Handley to vocalist Dave Davies and the two have remained close friends ever since. It was then that the band changed its name from Slither to the Radio Rats. When their first bassist Dion Coetzee (known as "Shorty", because he was tall) left for a banking career, David Parkin joined and stayed until October 1981. Dave Davies gave Parkin the nickname "Herbie", because he didn't want a band with 2 "Daves", and it stuck. 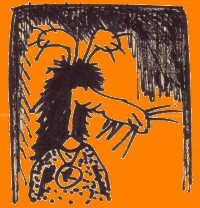 In 1979 The Radio Rats had a huge hit with the single 'ZX Dan' which went to number 2 on the Radio 5 (now 5FM) charts. It was held off the top spot by Michael Jackson! The 1978 album 'Into The Night We Slide' (which included 'ZX Dan') is still considered by many as one of South Africa's greatest rock albums. The Radio Rats never managed to capitalize on their success at the time, but the band's core of Jonathan Handley and Dave Davies continues until today. Handley, with various friends (sometimes also including his brother Graham), have released more music over the years under various guises. Besides The Radio Rats, there is also The Popguns, The Chauffeurs, Titus Groan, and The Glee Club. More or less since 1992 The Radio Rats have been involved in extremely sporadic gigs and hundreds of songs in preproduction, all released as The Glee Club [cassettes 1/1992 to 12/1998]. 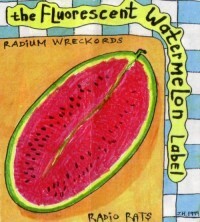 Radium Wreckords cc was formed in 1994.